Welcome back, Legends fans! Hopefully you're not all shook up from meeting Elvis this week, or, you know, too unsettled by the music of a haunted guitar capable of summoning the dead. Actually, you know what? Maybe we'd be better off not searching our feelings regarding meeting the king of rock 'n' roll this time around. The circumstances really weren't ideal. But either way, this week we finally got information pertaining to the mysterious sixth totem and—surprising no one, I'm sure—I was TOTALLY wrong in my guesses. I was banking on it being "metal," but it turns out the sixth totem is actually death. Here's what we know so far. The death totem’s powers revolve around "summoning" the souls of the dead via some sort of conduit, like a guitar in this case, but it doesn't seem to mean the wielder can actually control the spirits consciously. Instead, as far as I can tell, the death totem bearer is only able to direct the energy of the totem to summon spirits who are then just drawn to the totem itself. They're not particularly malevolent, though they do seem to be able to have agendas of their own, and it's completely possible for someone holding the death totem to use it without realizing or trying (as was the case with poor Elvis). So, what does all of that mean? Well, it's kind of hard to say right now. It could mean a lot, depending on who winds up using the totem next (and I mean, let's not kid ourselves about that, it'll probably get used again, right?). After all, there are no shortage of dead people the Legends themselves could benefit from contacting...I'm not condoning necromancy or anything, but...I'm also not not condoning it. Listen, if time itself is at stake here, I don't think we have time to get too concerned about the morality of conscripting an army of ghosts if said ghosts could be useful, that's all. …Don't look at me like that. Beyond the death totem itself, this episode had a lot to do with music (if the whole Elvis thing didn't give that much away already), which is actually going to serve as your big, strange, cosmic #DCTV Secret for this week because as you may or may not know, music is actually a massive and integral part of the DC Universe itself. If you're not up to date on the comics side of things, the last year or so has been dominated by the all-out rock 'n' roll extravaganza event called DARK NIGHTS: METAL and it's all about, well...metal, both as a physical element and as a genre of music. The whole thing revolves around the idea that the barriers between dimensional planes in the multiverse are actually built on vibrational frequencies, sounds and chords—notes that can be played together to blur the lines of reality. Oh, and it's all about Batman. You've heard of that guy, right? Sure, he's not a Legend or anything, but don't hold that against him. The point is that music and superheroes are two great tastes that go great together...even when they're combined to resurrect whole armies of vaguely malevolent ghosts or to warp reality itself. You know, like you do. So now with all six totems accounted for, all that's left is to figure out exactly how to use them to stop Mallus and potentially save Nora, if there's anything left of her to be saved. That is, of course, assuming that the Legends are able to even get the totems that the Darhks still have back in their possession and assuming that the nonstop torrent of anachronisms doesn't break Mallus out of his cage first and...well… Okay, sure. There are still a lot of variables and moving parts to keep track of here. Not to mention the fact that Ava's mystery is still very much a thing. You guys shared a few great theories about what might actually be happening with her last week: maybe she's a robot or an android of some kind, or maybe she's someone's time-displaced child, both of which seem pretty plausible to me. I'm actually pretty partial to the android idea, but I just can't figure out why being an android would be so important to keep from Sara, you know? Let's keep workshopping those theories in the comments because I have the distinct feeling that we're counting down towards a bombshell before this season is done. 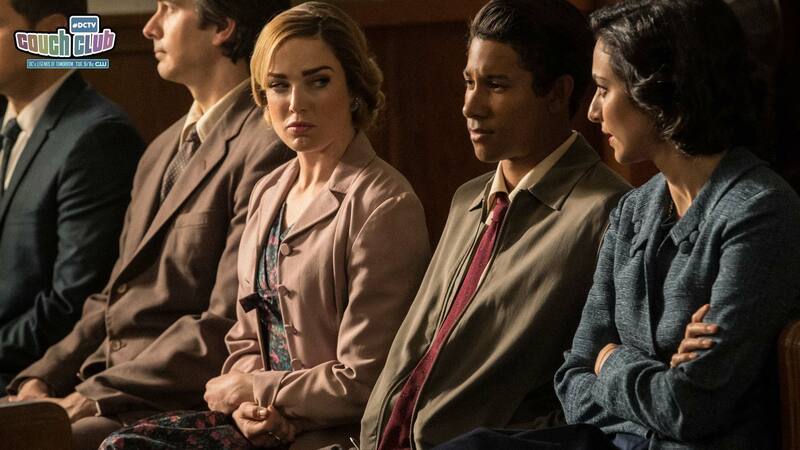 Meg Downey covers DC's Legends of Tomorrow as a part of the #DCTV Couch Club. Look for Meg on Twitter at @rustypolished. DC's Legends of Tomorrow airs Mondays at 8 p.m. (7 p.m. CST) on The CW.